This post was prompted by the publication, last week, of a story in the Washington Post about changes in language use in the US over the last 30 years. Some key takeaways from the story were the decline in rank of what one might term ‘European heritage’ languages such as Greek, Italian, Yiddish and Polish, and the rise of ‘strategically important’ languages, such as Chinese, Persian and Russian. I imagine that the differences in language distribution reflects both demographic change and shifting strategic priorities, but it all made me wonder about what makes a community prioritise one language over another. This eventually led me to reflect on what we can learn about a community from the way it decides on language learning provision. In this post, I shall attempt a broad-strokes theoretical answer of these questions, and then make some more specific comments about Greek education. One way to approach these questions is by drawing on the concept of ‘intentionality’, which we might roughly define as the ‘purpose’ which shapes language provision in education. In my PhD thesis, I describe intentionality as a synthesis of individual aspirations, resources, political priorities and other bottom-up and top-down influences on language policy. This gives me a way of thinking about purpose at a remove from individual agency, and I think that such a construct is useful in the context of this discussion as well. Language policy then, can be understood as a phenomenon that emerges from the interaction of multiple intentionalities. Some intentionalities might be instrumental, e.g., pertaining to increasing employability and market competitiveness, or even to national security. Others may reflect class aspirations and cultural values. To illustrate, it has been argued that the New York French dual-language programme is motivated by the belief that: “our little ones must even now know some French to qualify as what used to be called ‘people of quality’”. Intentionalities may be embedded in broader drives to preserve heritage and diversity, and to protect human rights; or they may reflect political issues that transcend linguistics and education, as seems to be the case with the promotion of Russian as a foreign language in Syria and Finland, and in the decision by Vietnamese authorities to limit English language provision. What all of the above seems to suggest is that there is scope for a research agenda that aims to: (a) empirically identify the intentionalities present in communities; (b) trace their origins, by associating them with ideologies and practices of these communities, as well as with contextual influences; and (c) investigate the effects associated with the interaction of multiple intentionalities. Such an investigation, I believe, would help to uncover (perhaps even challenge) patterns of power permeating social life, which may not be immediately obvious. An example: Mandarin or French? After these theoretical remarks, I shall try to exemplify some of the issues raised with reference to the language policies of the Greek education system. As I shall only offer anecdotal evidence, I can make no strong claims about the generalisability of my observations, but even so, I think that they have some value in illustrating how one might problematise language policy, and how such thinking can generate insights about the power structures that run through language education. In my previous job, I was involved in the Modern Foreign Language provision of what is known in Greece as a ‘Model/Experimental’ school. As part of our mandate to experiment and innovate, we successfully deployed After School Clubs (ASCs) where students were acquainted with foreign languages and cultures. At the time, the Chinese Embassy in Athens suggested that they would be keen to support the teaching of Mandarin in ASCs by providing some modern experimental schools with resources and staff. In June 2013, we were authorised by the Ministry of Education to gauge student interest with a view to planning for the next school year. The Board of APLF would like to express their strong displeasure at the decision by the Ministry of Education to introduce the teaching of Chinese in the ASCs of the model/experimental schools. Multilingualism is certainly desirable, and the Ministry should treat it as a main objective, on the condition that it preserves the employment status of existing staff. 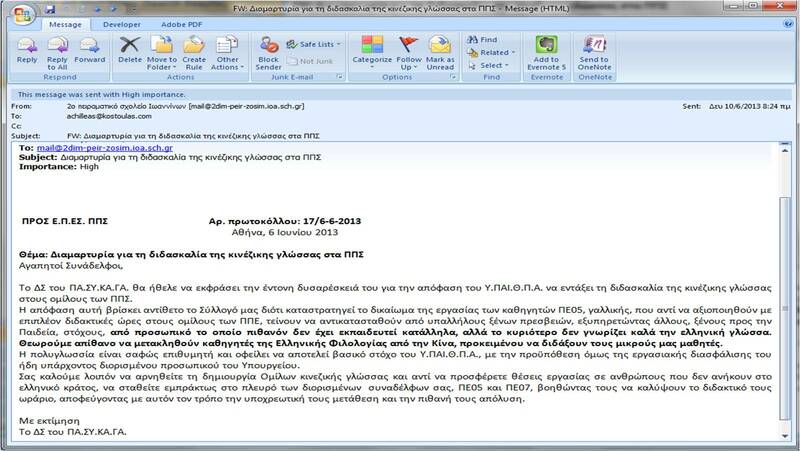 We therefore request that you refuse the creation of Chinese language ASCs, that you do not provide employment to people who do not belong [sic] to the Greek government, but rather that you take action in support of your colleagues who teach French and German, thus helping them be fully employed and protecting them from […] redundancy. As a result of such pressures, the Mandarin programme was eventually downscaled by the Ministry, and Chinese is currently offered in only two model experimental schools (out of 45 across Greece) (Update 2017: the link to that story is no longer active; I doubt that the information is current anyway). I suspect that this token adoption was only motivated by concerns over offending the Chinese government by turning down their offer entirely, and I’ve been informally briefed that the programme will most probably be terminated after its trial run. It is probably not a coincidence that provision for successful Italian and and Spanish courses is also being phased out from mainstream education, with students being diverted to the under-subscribed French classes. To relate all this to the previous section, the ministerial decision to aggressively promote the teaching of French at the expense of other languages seems paradoxical, especially when seen in the context of international trends in Modern Foreign Languages, and in the face of empirical evidence which suggests that French may be a low priority for many students and parents in Greece. However, it does begin to make sense when viewed as a product of a protectionist intentionality, which I define as the tendency of some educational systems to prioritise the self-serving interests of the teaching apparatus, rather than the needs of the learners. This intentionality appears to operate alongside commercial interests, perceptions of European identity, and the concerns over the preservation of the cultural capital of élite groups (French has been traditionally associated with the Greek upper and upper-middle classes), all of which work together to override what seem to be more rational choices. Tracing the origins of the protectionist intentionality in this example provides us with insights into the power structures that permeate Greek education and Greek society, which might otherwise remain unnoticed. For instance, it reveals a ‘linguicist’ ideology, according to which competence in Greek is presented as a requisite for teaching foreign languages, thus excluding both foreigners and members of linguistic minorities. It also indicates a thinly revealed distrust for any education provider that does not report directly to the state apparatus, thereby allowing groups with privileged access to the government to further their particular agendas through schooling. Moreover, it offers hints into an educational culture where students and their parents are disenfranchised, and which transforms state education into an instrument of control. Apart from the above, I believe that by raising awareness of which intentionalities are present in a community, of their origins and their effects, we might be in a better position to critically appraise whether the eventual synthesis is in line with our collective aspirations, our beliefs about pedagogical usefulness, and our values about social justice. At very minimum, the process of disentangling the intentionalities should help us to formulate awkward, but necessary questions, such as: Whose interests does our language policy serve? How can a fundamentally flawed language policy be resisted? How can checks and balances be used to lead to a better language policy? In this post, I argued that the distribution of languages in a community is a product of bottom-up and top-down processes; I put forward the construct of intentionality as a means to group these processes according to the purposes implicit in them; and I used an example from Greek education to illustrate how this construct can help us to understand, and question, language policy. Why should we even care which languages are spoken and how they are determined? The simplest answer is that, in my opinion at least, questions of language can never be fully disentangled from questions of power. The distribution of languages in a community, their visibility and their access to resources do not just ‘happen’; they index, and perpetuate, power structures of that community. Such structures are preserved, in language policy and elsewhere, by passing off as self-evident, or ‘natural’, whereas in fact they are merely artificial constraints whose existence depends on tacit consensus. By making the links between power and language policy less opaque, democratic participation in decision-making processes seems more conceivable.